That is what cruisers that have recently spent down time for repairs at Active Marine and Fonatur Marina in Mazatlan, Mexico are saying. Most cruisers have spent some time living in a yard. If you must be off of the water for an extended time you are much better off with a comfortable, clean environment and the services you require easily within reach. 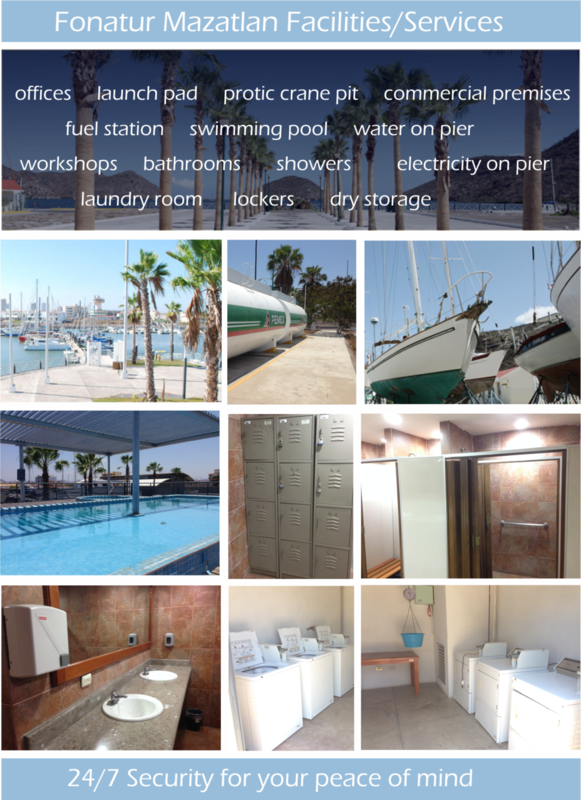 Super clean and comfortable showers, bathrooms & laundry facilities are awaiting your arrival in Mazatlan Mexico Fonatur Marina. With hundreds of square yards of concrete you will find our marina and yard to be far more comfortable than any other operation that is south of the boarder. We are very well protected yet it's really easy to find your way in and out. If you are visiting or even planning to live aboard for an extended period our location is simply amazing. Everything you need is a short walk or ride from the dock. And if you plan to explore inland Mexico, some of the most amazing cities like Guadalajara and Tequila are only a 4-5 hours away. Wal Mart, Sears, A Brand New Mall and numerous restaurants are within walking distance of our facilities. At Your Service! Our experienced crew is ready and waiting to take care of your service, restoration & mechanical needs while you enjoy everything Mazatlan has to offer. Head over to the Why Us? page at activemarinemazatlan.com for more detailed information or if you would like to contact us. Active Marine is a story is about a group of highly qualified boat repair and service technicians in Mazatlan, Mexico. Until recently, they worked for the most successful repair center in the region. Unfortunately, a dispute between the owner and former partner lead to an iconic and reputable business shutting it's doors. The closure left some of the most skilled workers in the region wondering how they would take care of their of their own families. Thanks to their perseverance and some assistance from valued and trusting customers they are back in business and ready to write a new chapter. The story is best told by their first customer who's boat is the namesake for Active Marine Mazatlan. The photo at the top of this blog entry shows the team of workers who are former Total Yacht Works employees. Without the dust having settled on the problems we faced these folks forged ahead and took good care of us. From left to right the guys are Victor (painting Manager, David (mechanic) Ernesto (painter), Roberto (parts) Scott (gringo) and Margarito. "The photo was taken under the bow of Active Transport with the travel lift in place to pick the boat up and drop it back in the water. Since the events described in this blog post this team has established a new business to take over where total yacht works left off. They have rented the shop from Fonatur, the yard owner, and have named the business Active Marine Services. Despite all the issues we have had with our haul out and repairs I would not hesitate to use this team again. They did not cause the problems but they sure fixed them. The team stepped up to the plate for us and got our work finished without any shortcuts. I'm very confident in their capabilities and do not hesitate to recommend Active Marine Services to cruisers who come after us. I also want to make it clear that we have no interest in this business despite the name they selected. We just want to share our positive experience with these men. " The preceding is an excerpt from the full story which can be found at sailblogs.com. The team here at Active Marine would like to extend their appreciation to John and Shawn for their understanding and the faith that they had in the crew. Active Marine Service is a team of experts specializing in full service repair and restoration for both Powerboats and Sailboats. Active Marine Sales specializes in sales and brokerage of both Powerboats and Sailboats of all makes & models. Whatever your job, Active Marine will go out of their way to exceed your expectations on all levels. Thank you! We will keep you informed of important happenings here in Mazatlan that are marine related.